Shall I compare thee to a summer's day? No I think I'll compare you to a teabag darling. The card reads like a Viz Top Tip - who on earth wrote this? And it's huge and looks like it has been made out of pink icing. Has the world gone mad? I think Jade Goody's death is both tragic and frightening. I think she has done a great thing raising awareness for cervical cancer and has shown exceptional bravery in the face of her shockingly premature demise but that is what happens when you are dying - it gets ridiculously busy and there is no one as forthright or humblingly brave as a dying person. It sounds odd but when I looked after my terminally ill friend I felt both numb and privileged. Numb in the sense it all seemed so unreal and you could do nothing but accept the unrelentingly gruelling situation which was very tough on the psyche at times. Privileged in the sense that it was extraordinary to witness such strength in the face of knowing and feeling there is very little time left - the moment is crystal clear at all times, the moment is there like a big hand in front of your face. I bow to Jade's honesty in allowing the press/tv to follow this process but I can't help feeling it all turned a bit 'Team Jade'. Is this the acceptable face of reporting now? Is there anything we don't need to know anymore? I find that invasive and sad. I think it also creates a 'them' and 'us' divide in society. Not that healthy really. Yes - one in ten school-leavers are now unemployed. Perhaps this song needs to be re-released? Unfortunately it may lead to more UB40 songs being re-released which would not be good. I think this was the only song they did that was any good. An anthem for the Thatcher and now post-Blair generation. Here is another secret snap a la Roche Mere. Crochet? On the bus? I pity the recipient of this cardigan or blanket I really do. 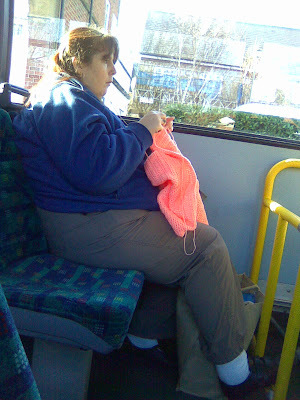 She was absolutely engrossed as she deftly wound the unfortunate salmon twine and had headphones on. I wonder what she was listening to? Someone on twitter suggested Nitin Sawhney - chortle fnar! It has been an auspicious week after the found wallet was returned to it's rightful owner (see previous post). Saturday - got an e mail saying that we have been shortlisted for another development scheme run by UK Film Council/Tribeca Film Festival. They only take two prod/dir teams a year. We do the conference call today. Let's hope we get through but to be shortlisted alone is pretty good news. If we get it - we go to LA in April to pitch the film to more than 20 'execs'. Cool. Tuesday - get a call from a company did work for last year - they were calling to apologise that they have sent last 4 payments to wrong sort code - they owe us £2500.00 !!! We are now no longer panic-stricken and can pay bills. Weds - my lovely friend Anna gives me a brand new (and much needed) mattress to say thank you for me helping her move house and doing DIY. 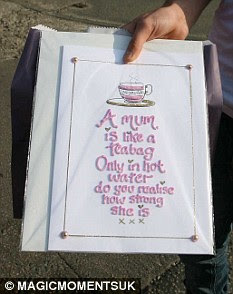 I didn't expect a present - I did it because she is a single mum and my friend! Today - come back from dropping the feisty small ginger squidget off at school and notice that there is a wine box on the doorstep. Two incredibly sumptious bottles of wine and a card saying: Dear Rockmother, thank you for being such a good samaritan. It genuinely made my bottom lip tremble and I got a little teary as I really didn't expect a present or to be called a good samaritan. Sniff sniff. Just off to blow my nose and wonder over the joy of good deeds. I did a very good deed last Wednesday and it nearly didn't happen. It wouldn't have happened had I not been so indecisive and changed my usual route home which is what I did by changing trains at the very last minute. Waiting on the opposite platform for an alternative train I watched one come and go. As the doors closed I heard the hefty thwack of a wallet hit the platform. I rushed forward and realised that one of the couple who I could see rammed up against the now closed doors must have dropped it. I knocked on the doors of the train waving the wallet to get the couple's attention. They completely ignored me and turned their backs laughing together - then the train jerked forward. I stepped back a bit anxious as to what to do. I looked around and no one seemed to have even noticed this little non-exchange so I just stood there with this big thick man's wallet throbbing like a heavy heart in my hand. I stuffed it in my bag under a book in case it should get lost again and decided to hand it in to the station police once I got to the other end. But of course - there were no police at the other end and I suddenly had the feeling should I be bothered to hand it in at a local police station it would probably end up languishing in a drawer never to be returned. I took it home and had a proper look through it. No cash, a few cards, family photo's (some very old), driver's licence and a ticket for the Chelsea vs Juventus game which was starting in 30 mins! It then became apparent that the owner of the wallet wasn't even from London but Belfast and was probably at that point standing bewildered at the turnstile! I had another rifle through it and found a hotel key. To cut a long story short - I called the main number as the key only had the word Radisson printed on it. I got put through to a lovely Irishman called Terry in Dublin (Radisson HQ apparently) who was very excited about the prospect that a customer was going to be reunited with their wallet. From that point on it all got a bit silly. For a start we located Mr Lost Wallet via the last 4 digits on his last remaining credit card. Terry in his amazement and excitement it transpires took my mobile number down minus a digit. He then spent the next two hours trying different configurations of my mobile number and finally by fluke got hold of me. When he did he was almost exploding with joy and told me I was a saint and deserved a big present - ohh I thought - a week's break at a Radisson of my choosing? A feature in the Radisson Monthly Newsletter? He then gave me Mr Lost Wallet's wife's mobile number although he said she may call me. He finished off by telling me that I was on his wavelength and there weren't enough people like us in the world. I couldn't agree more and I sort of wanted to give him a big telephone hug too. Next...briiing briiiing....it's Mrs Mr Lost Wallet absolutely over the moon about the wallet. We went through an inventory of what was in the wallet, how I found it, how she has 10 daughters and if I get an odd message on facebook then it was them and Terry trying to find me and how her other daughter had won a competition recently - an all expenses paid trip for 2 to see the Chelsea game in London that night. Luckily, luckily because the lost wallet contained a ticket that was a prize they still managed to get into the game so all was not lost. Then she told me if I was ever in Belfast that I must visit (and I am the kind of person that would too). I asked her where in Belfast they were - ha - only the same road that my bloody cousins live in. Too too weird. At that point, we both had a communal telephone slurp of wine and chink of glasses as we shared the joy of it all. An hour later Mr Lost Wallet himself turned up to claim his wallet back. I invited him in as I went to get it. He said thank you, you'll be hearing from us and scuttled out into a minicab where his other smiling daughter waved from the back seat - and that was it. Do you know I think he said thank you but I can't be sure. I think he was a bit shy despite the fact he had ten daughters. Ten daughters. No wonder there wasn't any cash in the wallet.